The marketing of luxury brands is a highly complex and difficult task and differs strongly from the management of ordinary brands. At the heart of the difficulty lies a paradox: To increase sales and at the same time to preserve exclusivity. A luxury brand has to be anchored in the heads of as many people as possible and be desired but it must remain inaccessible to most of them. 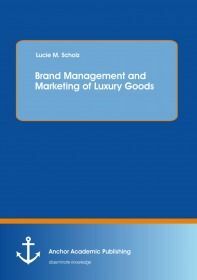 The more a luxury brand or good gets actually purchased, the more it loses ist aura of exclusivity, ist attractiveness and ist 'dream value'.The purpose of this book is to analyze the specificities of the management and marketing of luxury brands in comparison to ordinary brands. The analysis will mainly focus on the four elements of the marketing mix, namely product, place, price and promotion. A detailed analysis of the four elements will disclose the particularities of luxury brands and present the requirements of successful luxury brand management which is able to overcome the difficulties resulting from the mentioned paradox.